Breaking his silence in a jailhouse interview, the white Florida man charged with manslaughter in the fatal shooting of an unarmed black man in a dispute over a parking space says "I cleared every hurdle" of the state's "stand your ground" self-defense law. Michael Drejka spoke for the first time since being arrested and charged in the July killing of Markeis McGlockton, who was gunned down in front of his girlfriend and children. 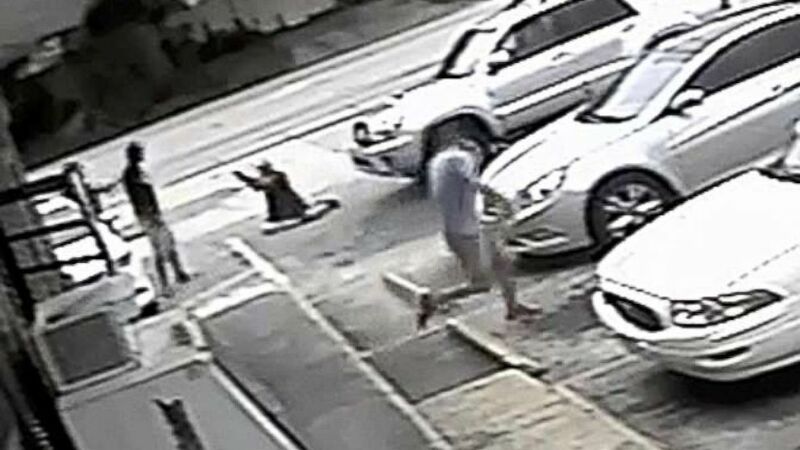 Drejka, 48, invoked the "stand your ground" law, saying that he was in fear of his life after McGlockton shoved him to the ground when he came out of a convenience store in Clearwater, Florida, to find Drejka allegedly berating his girlfriend, Britany Jacobs, about parking in a handicap space. "I followed the law the way I felt the law was supposed to be followed," Drejka told WTSP-TV in Tampa Bay. "I cleared every hurdle that that law had put in front of me." Asked if he could go back and change anything he did that fateful day, Drejka said, "No, [not] off the top of my head." On July 19, Drejka spotted Jacobs sitting in her car parked in a handicap spot outside the Circle A convenience store in Clearwater waiting for McGlockton, the father of her three children, to come out. (Pinellas County Sheriff's Office via AP) In this Thursday, July 19, 2018 image taken from surveillance video released by the Pinellas County Sheriff's Office, Markeis McGlockton, far left, is shot by Michael Drejka during an altercation in the parking lot of a convenience store in Clearwater, Fla. He said he confronted Jacobs because he has a "pet peeve" about seeing people illegally parked in spots reserved for the disabled. Drejka said he once had a childhood sweetheart who was disabled in a car crash when she was 16, and that his mother-in-law is disabled. 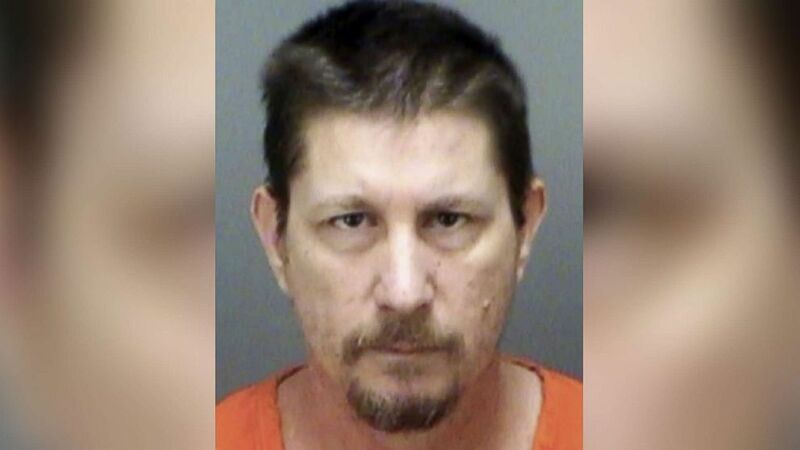 "I always said, my whole life is always looking for a handicapped parking spot," Drejka said in the interview conducted Friday at the Pinellas County Jail, where he is being held on $100,000 bail. "And it just always touched a nerve with me." Investigators said Drejka, who is not disabled, was alone on the day of the shooting. He denied that the episode with Jacobs and McGlockton had anything to do with race, and said it was "totally false" that he used racial slurs in the encounter with Jacobs or anyone else. Drejka refuted allegations by attorneys for Jacobs and the McGlockton family that he is a racist. "No sir, not by any means," he said. "I've worked with too many people, I've met too many people in my life to be that kind of person. There's no way to survive really by being like that." 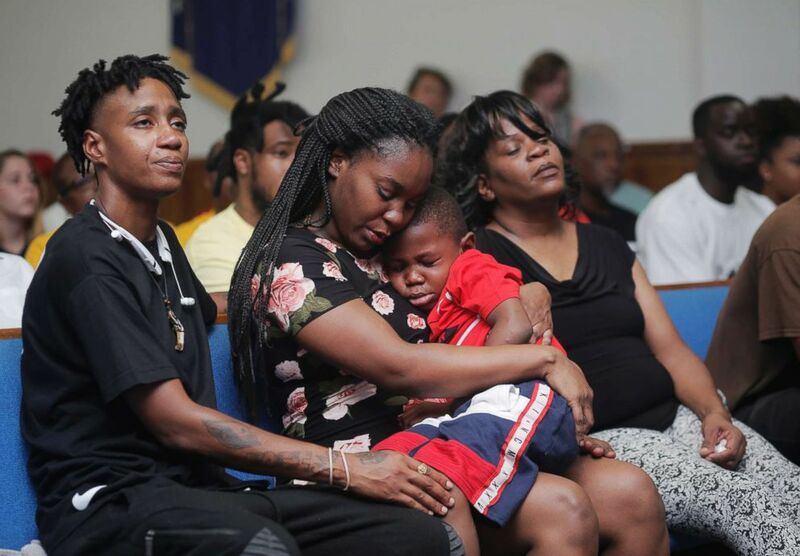 (Octavio Jones/Tampa Bay Times via AP) Britany Jacobs, 25, consoles her 5-year-old son Markeis McGlockton Jr., during a vigil for his slain father Markeis McGlockton Sr., 28, while their cousin Mesha Gilbert, 26, left, looks on at Mt. Carmel Baptist Church in Clearwater, Fla., July 22, 2018. Surveillance video taken from in front of the Circle A store showed McGlockton, 28, getting between Drejka and Jacobs, and shoving Drejka to the ground. Drejka, who had a permit to carry a concealed weapon, is seen in the footage pulling a .40-caliber Glock handgun while he was still on the ground and firing it at McGlockton, who appeared to be retreating. The video shows McGlockton being shot once in the left side. Jacobs said she and McGlockton's 5-year-old son witnessed the shooting. McGlockton stumbled back in the store mortally wounded and later died at a hospital. Drejka said he feared for his life when McGlockton "tackled" him to the ground. "There was only one way to look at that. You have to be scared ... because if you’re not and you're wrong you know … that’s that," he said. "So, yeah very scared having never been confronted like that or never been assaulted like that if you will." Pinellas County Sheriff Bob Gualtieri initially declined to arrest Drejka after the gunman invoked the "stand your ground" defense, saying his decision was bound by the law. Drejka said he felt "vindicated" by Gualtieri's decision, even as protests broke out in Clearwater and across the nation over the shooting. "I'm a strong supporter of Second Amendment rights and the fact that everybody deserves to feel secure in their person no matter where they go or what they're doing as long as they're there legally, of course," he said. "So yeah, I guess you can say I'm a big supporter of the Second Amendment. I suppose not overtly outspoken about it, but in my heart." When asked if he could say anything to McGlockton's loved ones, he initially declined. But later in the interview, he said, "I'm sorry, that's all I can really say to them." "And thinking about it, would you accept those kinds of words from someone? I don’t think I would," he said. He said he was surprised when Pinellas County State Attorney Bernie McCabe filed a manslaughter charge against him on Aug. 13. Drejka denied that he voluntarily turned himself in. "They lied to me," he said of the detective who arrested him. "And under the guise of returning my property, he requested me to show up at the sheriff's office to talk to the original detectives." The only time in the interview that Drejka showed emotion was when he spoke of his wife and children, who he claims have been facing death threats and eviction from their rented home. "I miss my girl. I miss my girls. All of them, yeah," he said crying. Attorneys for Jacobs and the McGlockton family could not be reached for comment on Sunday. They have previously praised McCabe for filing charges against Drejka while criticizing Sheriff Gualtieri for not arresting Drejka immediately. "I support the state attorney's decision and will have no further comment as the case continues to work its way through the criminal justice system," Gualtieri said in a statement after Drejka was charged with manslaughter. Jacobs' attorney, Benjamin Crump, has called Drejka a "self-appointed wannabe cop" who attempted to "hide behind 'stand your ground' to defend his indefensible actions." "I have full faith that this truth will prevail to punish this cold-blooded killer who angrily created the altercation that led to Markeis' needless death," Crump said the day Drejka was charged. "We will continue to fight until justice is brought for the family of Markeis McGlockton." Drejka has plead not guilty to the charge and has a pre-trial hearing scheduled for Oct. 19.